Looseleaf binders, No. 2 pencils, rulers — and bulletproof whiteboards? Armored accessories including backpack inserts and clipboards are showing up on back-to-school shopping lists in the wake of campus shootings, from the Sandy Hook massacre to this week's gunfire in Decatur, Ga. But some security experts say safety-conscious supplies like whiteboards-turned-shields are impractical at best, and a diversion from real life-saving resources at worst. "It may be well-intended but it’s not well thought-out," said Ken Trump, a Cleveland-based school safety consultant and father of young kids. 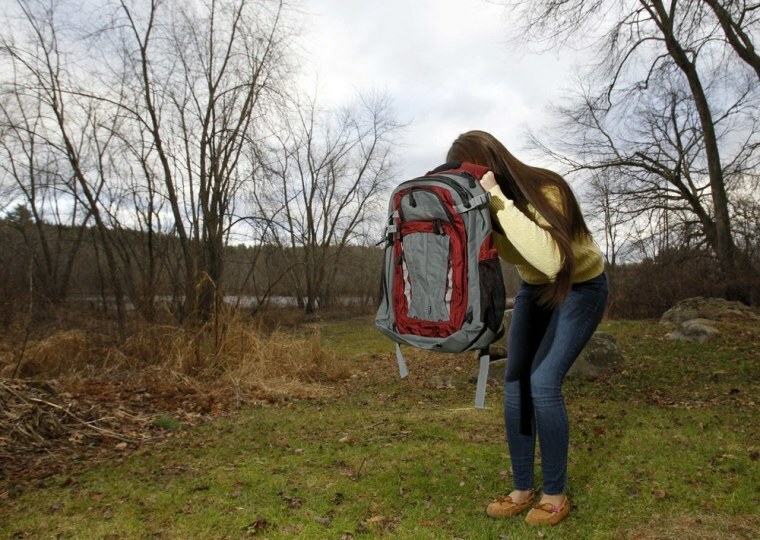 "I would ask this question: If you need a bulletproof backpack, wouldn't the child also need a bulletproof front pack and a helmet and a Captain America shield?" He noted that children often don't have their backpacks nearby when they're in school. "I have a vision of a classroom of kids running down a gym court playing basketball with their backpacks on," he said. "And the ballistic whiteboard? Is the teacher going to tell 25 kids to line up behind at the right angle?" Michael Dorn, executive director of Safe Havens International, a non-profit that has conducted more than 5,000 school safety assessments, said his group has been bombarded with armored product pitches. One German engineering firm even offered to make an entire school bullet-resistant — at a cost of more than $3 million. The problem with these inventions is "they’re not practical from a cost-benefit standpoint," Dorn said. "We could cut the death rate in half in our schools with things like good student supervision and better drill processes." Still, with memories of the bloodshed at Virginia Tech, Sandy Hook and other schools still fresh, administrators and parents are shelling out big bucks to give their students any edge on surviving a mass shooting. "We've been selling them all over the United States," Steve Jurak of the San Diego firm Mighty Mojo said of the LifePlate, a $149.95 backpack insert that he says can stop a bullet from a .44 Magnum fired at 15 feet. "Whenever there is a blip, some random act of violence, we see a surge in sales." The University of Maryland Eastern Shore just spent almost $60,000 from a private foundation to buy 200 bulletproof whiteboards — at $299 each —from the military vendor Hardwire. "I heard a faculty member who had worked at Virginia Tech say yesterday that if investing $50,000 saves one life, it's worth it," college spokesman Bill Robinson said. "We understand it’s not the panacea, but it’s a tool in the toolbox of security." Hardwire chief executive George Tunis said the 18-inch whiteboards, which weigh less than a pound, can be positioned near classroom doors so a teacher can grab one to defend against an intruder — or even use it to whack a gunman. "It doesn’t replace locking the door but in the event that we’re breached at least I have something I can go after them with," Tunis said. School districts in Minnesota and North Dakota and individual private and public schools have signed on, he said. Thousands of parents have purchased Hardwire's $99 bag inserts. The company even offers a bulletproof classroom door cover for $1,499. Safety consultants say these items might give educators and pupils greater peace of mind but are unlikely to be the difference between life and death. "There's feeling safer and then there's actually being safer," Trump said. "In the past five years we’ve seen draconian cuts to school security and emergency planning programs," he added. "Schools have limited resources and they ought to use that money very wisely, put it into an additional school psychologist or a school police officer, train your staff and work with first responders. The most valuable school security tools are invisible." Dorn said instead of buying shields, schools can improve security by revamping their drills so that staff members beyond the principal are involved in decision making and doing something as simple as making students line up in double rows when they move through the building. "We know if you put kids in in double rows and practice a brisk walk with them, you can reduce the time of evacuate and shelter by 30 percent," he said. "You can do that in the largest schools in the nation for less than the cost of one security camera." Gregory Thomas, who used to run security for New York City schools and now heads Alan Thomas Security, said "feel-good" solutions like armored book bags don't hurt anything but the wallet. But for his money, an ounce of prevention — particularly training school staff about the warning signs of violent students — is worth a lot more than any piece of polyethylene designed to absorb a gunshot. "You need to start with seeking out and identifying the kids that are likely to do these shootings before it happens," he said.